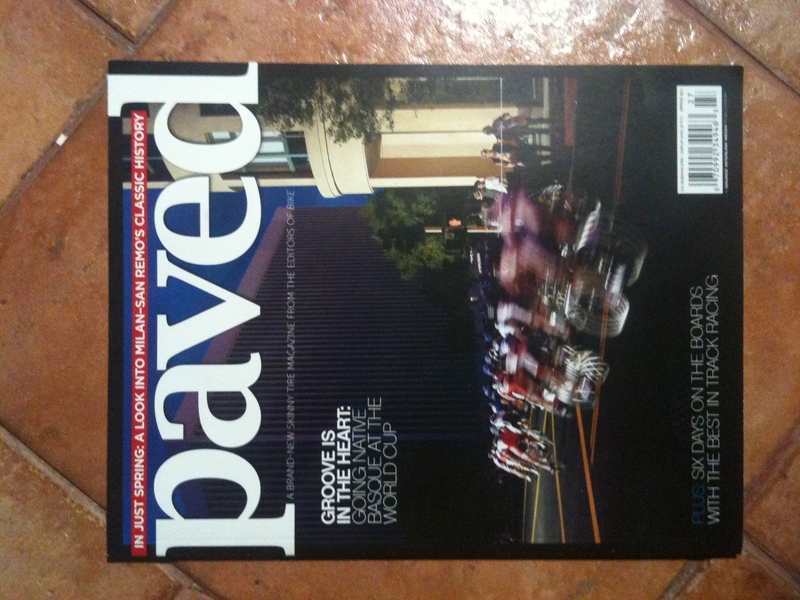 The other day I noticed a magazine on a news stand that I hadn’t heard of before – it is called “paved” with the sub title “A brand-new skinny tire magazine from the editors of BIKE. They call it “brand-new” but the issue I picked up is Issue 1 of Volume 2. I did get the impression from the editorial however that Volume 1 consisted of just a single trial issue in 2010. I like this magazine. I like that it is a substantial 98 page publication on good paper with good photos and interesting articles! 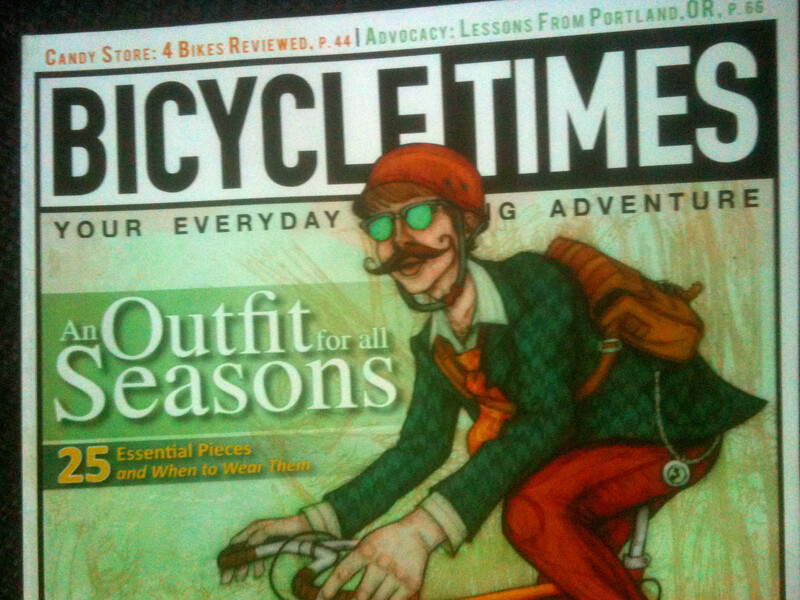 This magazine isn’t strictly about riding on paved roads. there is an article riding the mud at World Cup cyclocross races and a photo essay about riding the boards on the track for six-day races. Overall the quality of photos in this magazine is excellent. The section called “[proof]” has a number of full page photos of cyclists on the road – from Oregon to Banff to Nicaragua. What’s a cycling magazine without some equipment reviews? This one’s got a review of half a dozen high-end bikes ($10K price range) and a couple pages highlight of new gear (clothing, shoes, lights etc.) The magazine also includes a number of high quality ads for cycling gear. You can learn more about paved from its website, which includes links to their Facebook and twitter presence. “The Incredible Steve Bauer” – the words jumped at me off the magazine cover as I was browsing in a bookstore the other day. He was probably the greatest Canadian cyclist yet. I was a big fan of Steve in his heyday but I haven’t heard much about him recently. “I wonder what he is up to?” – that is reason enough to pick up this magazine and probably to buy it. What magazine? Canadian Cycling Magazine. I’d heard of this relatively new publication but hadn’t yet actually seen a copy. So I bought it and let me tell you what I think. I’m impressed. This is a quality mag. It looks good, feels good and the content is solid. I like all aspects of cycling and this magazine delivers across the cycling spectrum. The June & July 2010 issue that I am reviewing covers road racing with the feature article about former pro racer Steve Bauer, and another story about Canadian Kevin Field as an Assistant Director on the Livestrong Team. There is an article on cycling PEI (the Canadian province of Prince Edward Island) and a few articles touching on mountain bikes and riders. Nutrition, maintenance and training are all featured in this issue. If that wasn’t enough this issue also featured a Buyer’s Guide covering bikes as well as gear for road and mountain biking. So back to Steve Bauer. I’d forgotten the details of his cycling career and just how impressive he was. To mention just a few: 4th overall in GC at the 1988 Tour de France, 8th, 4th, 2nd and 4th in Paris-Robaix between 1988 and 1991, and in yellow at the 1991 Tour de France for 9 consecutive days. These days Steve is the Director Sportif of the Team Spidertech Powered by Planet Energy. The article includes talk of Bauer’s dream of having a Canadian team in the Tour de France and a little anecdote of how Lance Armstrong asked Bauer to be the director of U. S. Postal Team before asking Johan Brunyeel. Interesting stuff! I’m hooked. I’ll be subscribing. I know it can be tough for Canadian magazines to succeed and I wish Canadian Cycling Magazine the best of luck (however, if they can keep up the quality, luck should play only a small part).